It has often been said about hunting, that amongst other wealthy individuals, it is the preserve of the rich landowning classes of Great Britain and when one looks at the large estates owned by the Dukes of Buccleuch, Beaufort and Northumberland, who also have their own packs of hounds, it is quite easy to imagine this could be the case. However rather than be brought under the spotlight for this and the criticism they receive for it, let us look very briefly at the benefits that are the spin off from their interest in such an activity. In these particular cases they are the ones responsible for permitting the use of the land, providing financial support etc etc, all of which are a huge benefit not only to those that hunt but also others who enjoy our traditional countryside. 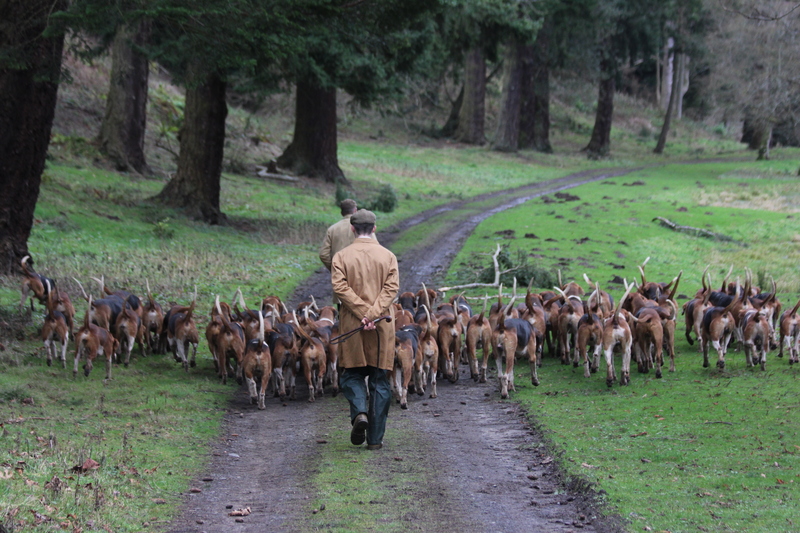 Hunting though, despite its image, has always brought together a vast number of people from all corners of everyday life, with a common interest, the hounds. 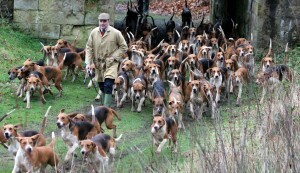 Not only are they the very centre piece of any Hunt, we can’t actually go hunting without them! 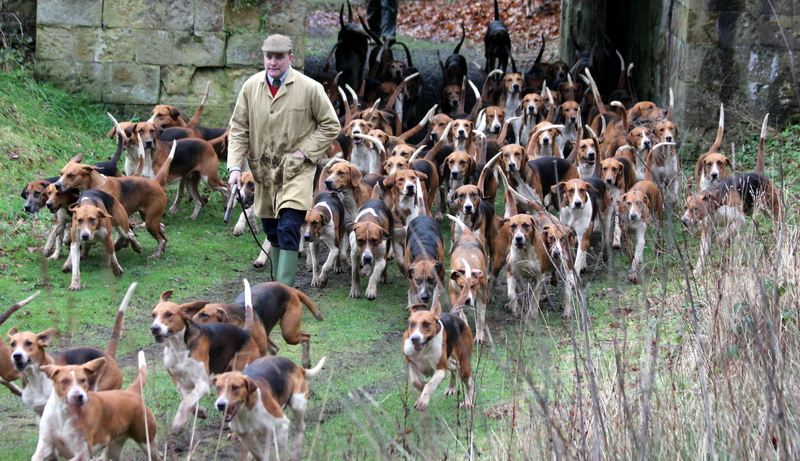 Take any holiday meet over the Christmas period and you will see every man woman and child naturally migrates towards the hounds, and who can blame them! So this article is based on them and the man who is in charge of their welfare at the Percy – Robert Mcarthy. In this piece, One hundred hounds, One man, we are going to spend a morning with Robert Mcarthy, the Huntsman to the Percy Hounds and investigate the “golden thread” he has with them and is so often overlooked in favour of an argument describing the likes of Robert as a “wicked barbarian”. 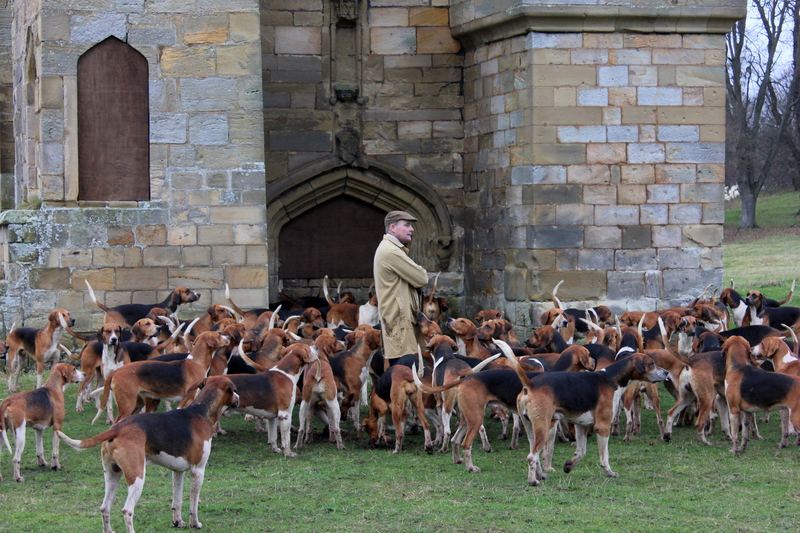 It is with grateful thanks to the Duke of Northumberland, Lady Victoria Percy and the Masters of the Percy Hunt that we have been given permission to visit these historical Kennels and Robert to see firsthand their wonderful Pure English Foxhounds in his care. Robert is .... and has devoted his life to hunting from a very early age and his knowledge of his hounds is very clear to see. They are his life! Born and bred in Suffolk, he and his family are now well settled in the North East and I cannot see him moving very far! 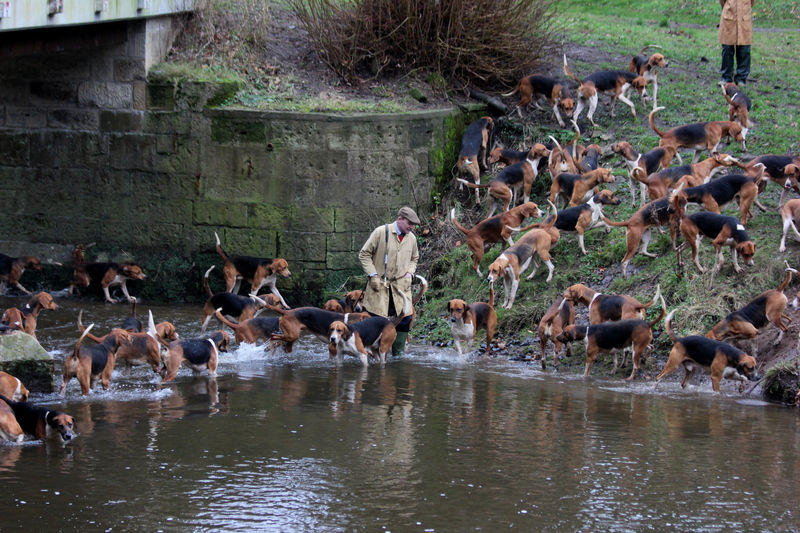 So what is it that makes one man earn the respect of a hundred hounds? This is something that cannot really be described in just a few words, however in this case it is the pictures that accompany this article that really tell the story. 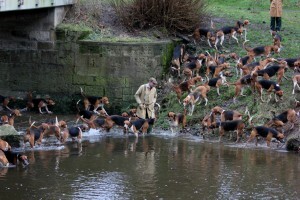 The Pure English Foxhound is one of the oldest breeds of hunting hounds in the World. Its distinctive colour of black, tan and white is what makes it stand out from its more modern brethren. After all it is looked at as the aristocrat of the hunting world! They ooze charm and character from every angle, but don’t they know it? 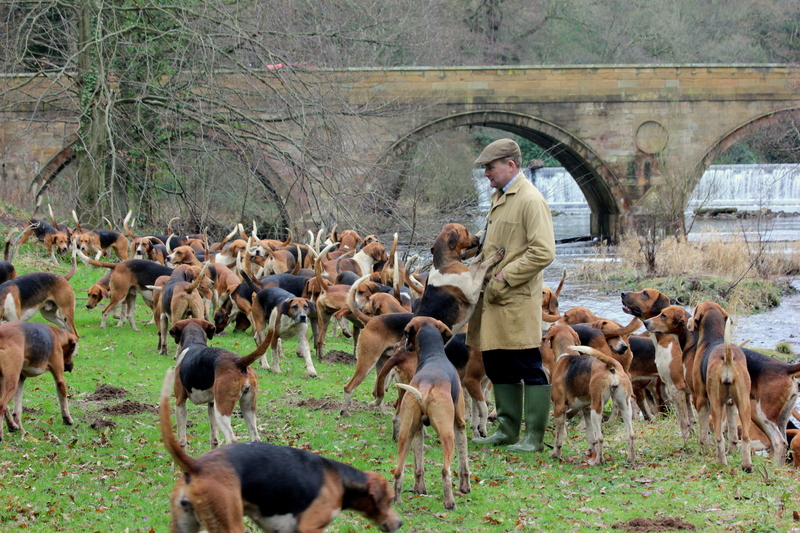 They can be wooden and stubborn, and that is why the link between Robert and his hounds is not only fascinating, it is of the greatest importance in the running of the Percy or any other Hunt Kennel. From the very moment you see them, you know you are in for a real treat. Robert’s assistant in the trade his “Whipper in,” is sorting out the hounds that we are due to take out for exercise. This is duly accomplished and anything that is not coming with us is put over on to another yard. The rest then wait patiently for the “Boss“ to appear. They can hear him not far away and every single one of them has their eyes transfixed in his general direction. As he appears at their kennel gate, that is that instant you witness the huge respect they have for him and that he too has for them. They become alive and are all over him and ready to go! Bursting out of the ancient Percy Kennels, like children leaving school for the day, they go so far and then back to him they come. There is no shouting, no cracking of whips, and this is something has to be seen to be believed, as Robert says it all comes down to two words, “patience and understanding”. The River Aln is the first port of call into which they quickly dip then over the bridge to the site of the old Abbey. 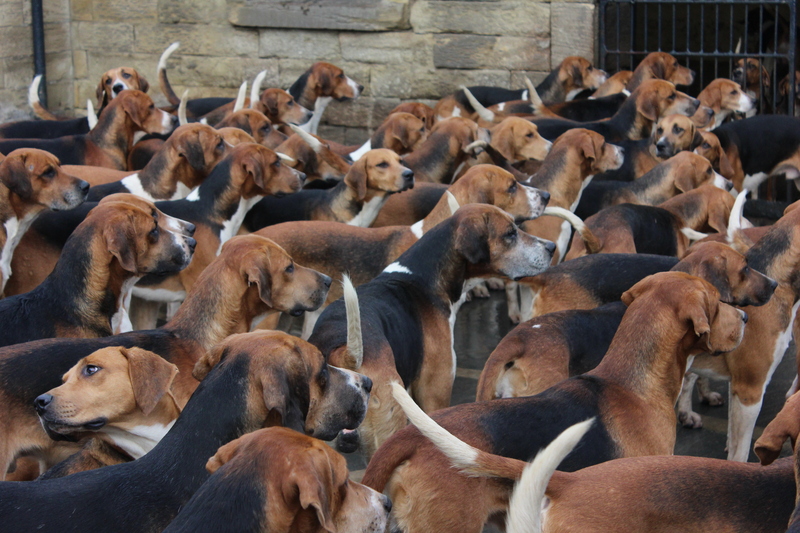 As well as enjoying our historical surroundings we can watch and observe the hounds and their huntsman working in total unison with each other. There is one cog in this particular wheel however that is missing today and that is the horse. Once the Huntsman is up aboard that golden thread of which we talk widens, taking on equine as well as canine thinking with decisions very often having to be made in a matter of a second or two. Quite something, when your conveyance is likely to be rather enjoying the occasion! However if the man or woman on top has the flare that it needs, it all comes totally naturally and is a joy to see. 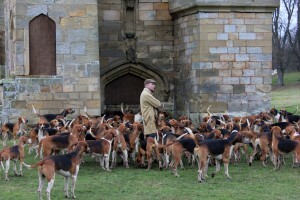 We return to the Kennels with all hounds as they say in the trade, “on” and the experience has been yet another one which demonstrates the fascination of that invisable link that exists between man and animal. Once one has got it, no man, not even the staunchest Hunt saboteur, can take it away from you, it is there for life. Sadly in the fast moving world that we live, it is something easily taken for granted or on the other hand ignored, but should it? The answer to me is very definitely –no and it is thanks to all those who generously back their Hunts that we are able to witness it at all, so a very large amount of thanks go to them.